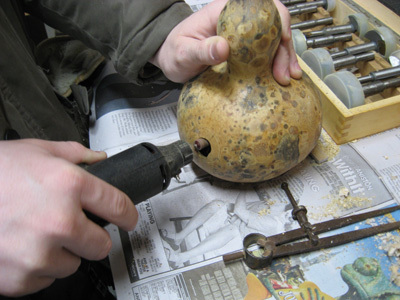 Yesterday I continued work on something I started over a year ago: turning decorative gourds into utilitarian bird houses. Remember these beautiful colors as this post progresses. The greens will give way to tones of brown and beige. Now the only green in sight is the scruffy side of the sponge! 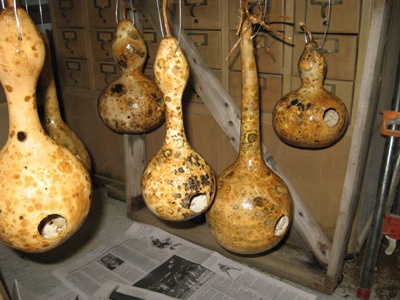 I found several sets of instructions on the internet for turning these dried gourds into birdhouses. I most-closely followed the instructions from the Amish site, which gives you instructions for making them yourself, as well as offering their own hand-made birdhouses for sale. 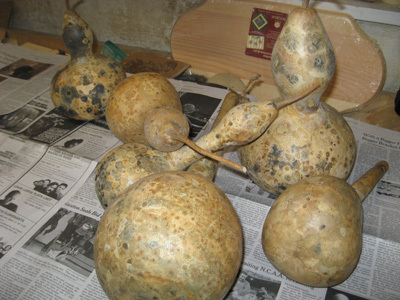 The instructions began by describing how to soak the gourds in a bleach/water solution to kill all mold. As I’d unwittingly skipped this step by simply allowing them to dry (and molder) in my home over the fall and winter, I jumped to step #2: scruff off the dead mold and dirt with an abrasive tool. I used a new sponge with the rougher green side. The small patches of white mold and a small amount of dirt lifted away. 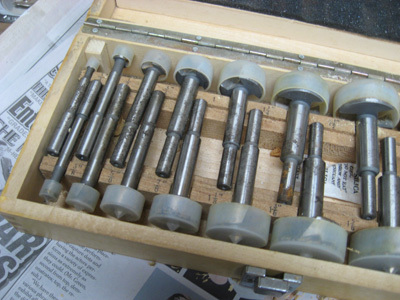 Clean newspaper on the workshop bench, and we were ready to go. 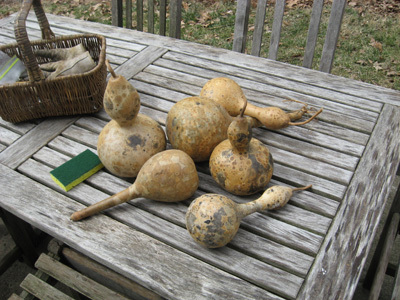 The bottle gourds stand obligingly. I looked at the hole-diameter chart provided on the Amish site, and determined that I wanted two birdhouses with openings suitable for bluebirds (1 1/2″), three suitable for downy’s, titmice, or carolina wrens (1 1/4″) and one for chickadees (1/18″). The plastic caps cover razor-sharp edges. A slow, careful start that did not end satisfactorily. Every mottled inch was beautiful to me, and so this imperfect circle was unacceptable to us both. I'm including this photo just because I liked its composition. I know a photo of the box itself doesn't contribute to a greater understanding of the process. 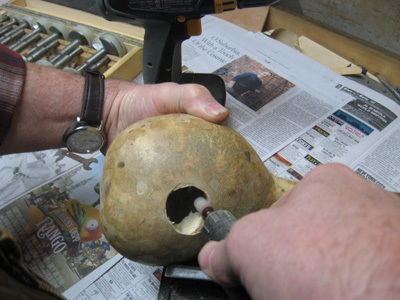 Grinding the gourd released puffs of fragrant smoke! The smell was a bit like pumpkin pie baking. The grinding begins, with the rejected bits in background. Worthy compass is alongside, waiting for the next job. The process continued. Husband did the first few, and I finished up. I was so eager for my turn. How many couples have to negotiate taking turns with a dremel?! 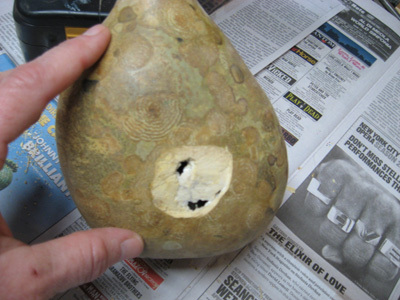 After each hole was opened, and ground to the edges of the scratched edges, I tapped and pulled to release the dried seeds and pith within. 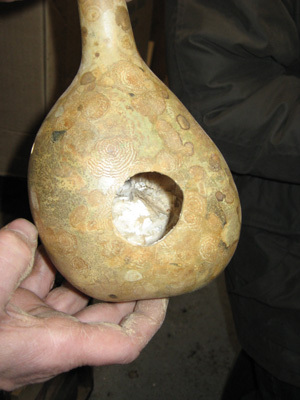 The interior of the gourds was a pearly white! Very pretty indeed. 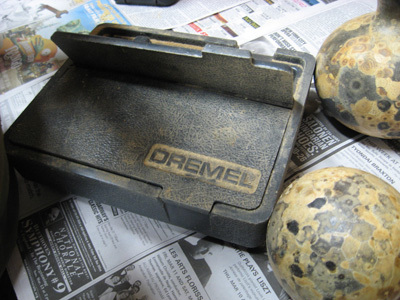 The inside is dry and, I would imagine, very inviting to a discriminating nester-mom. 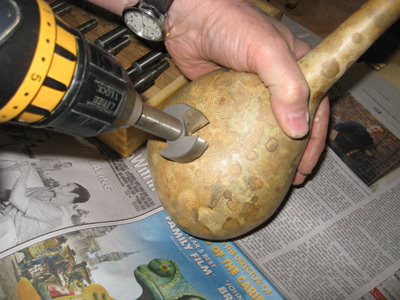 I drilled 4-5 drainage holes in the bottom of each gourd, 3 ventilation holes on the sides, trying to angle the drill bit in and up, to allow air in but keep rain out. I drilled a through-and-through hole in the upper neck, to thread the hanging wire through. Once done with that, I strung the gourds onto a stick, suspended over the newspaper-ed floor. Time for the poly(urethane). Dried, brushed, drilled, and ready. This is the first of three applications of polyurethane. Husband will apply the second and third coats of polyurethane this week. One birdhouse will go to the neighbors on the left, and one to the neighbors on the right. We will keep four. 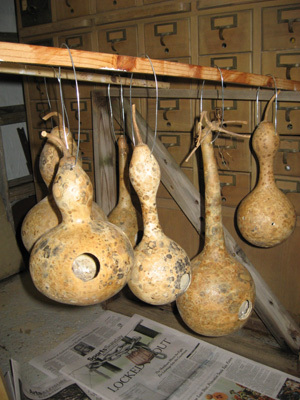 If the birds move in, I’m certain I’m going to plant more gourd seeds this year, to give us a new supply of birdhouses, mostly for gifts, for next year. If the birds like these, I will know in time for planting, as the birds nest before the ground warms up. 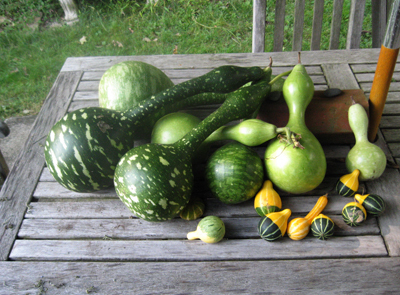 I was not planning to grow decorative gourds again this year, as the vines take up a huge amount of garden real estate. But this activity was tremendously fun, and resulted in such a pretty product, that I want a repeat next year! Photos, hopefully, to come of the new tenants! I will report to you.